Hey all it’s Ginny again! If you tuned in yesterday you will have seen my living room reveal and today I’m very excited to share my dining room with you all! 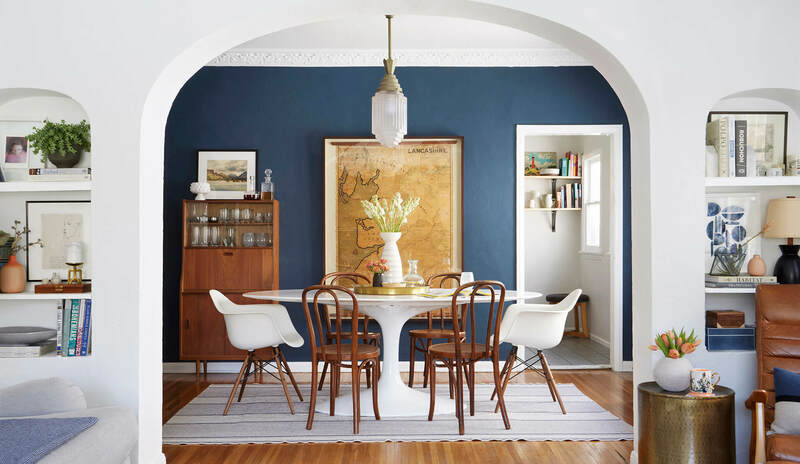 This room is probably one of my favourites in the house because of the dark blue walls. I actually only decided to paint those wall a few months back. I was really worried about losing the freshness that the white brought to the space. But in fact what happened was the opposite. It brought a deeper, moodier vibe to the room that I love. It also highlights the white trim around the windows and moulding details on the ceiling. 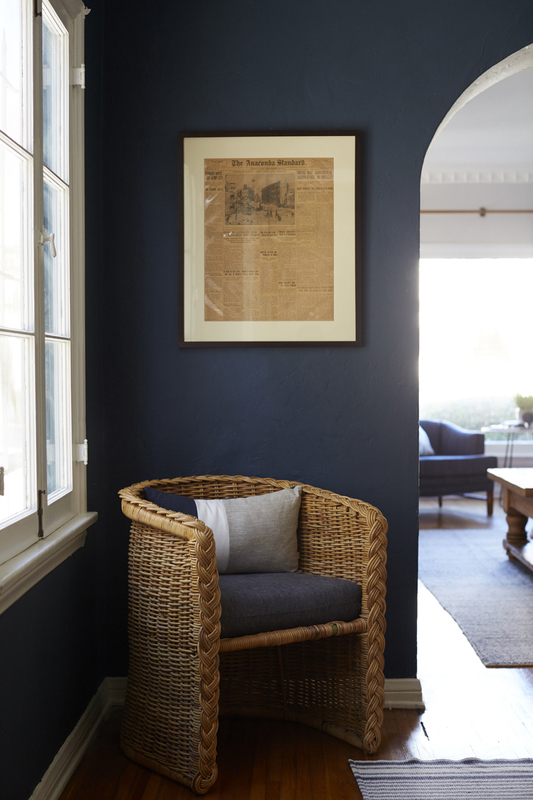 I used Farrow & Ball’s Stiffkey Blue, which to me is the perfect blue. I did try out an EHD fave – Hague Blue, but it had way too much green in it for me. And that’s why you should always, always swatch before committing because what might look great in one space can look not so great in another. This is also what sparked the thought to paint the living room and bedroom as well. 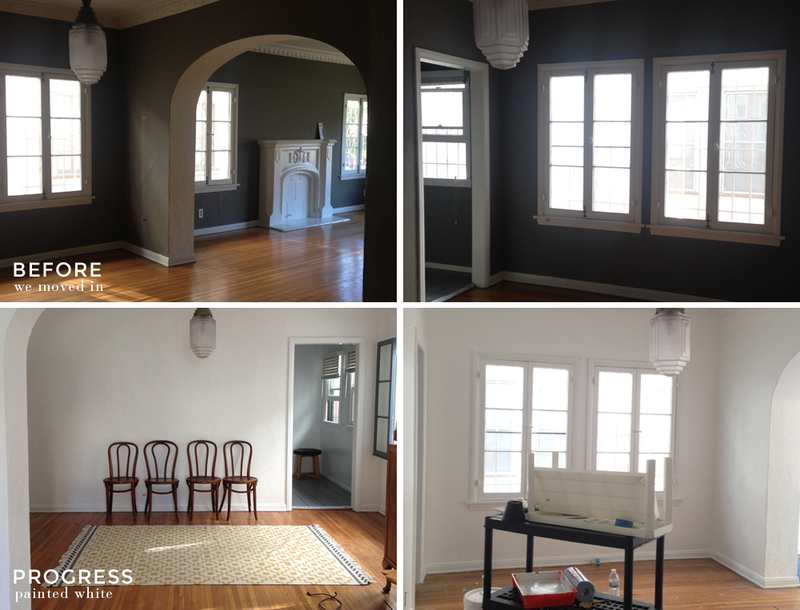 This is how the room started; painted out in a dark charcoal until we got the landlords to paint it out in a bright white to give it a fresh blank canvas. Look how sad it looks with a rug, chairs and no dining table. 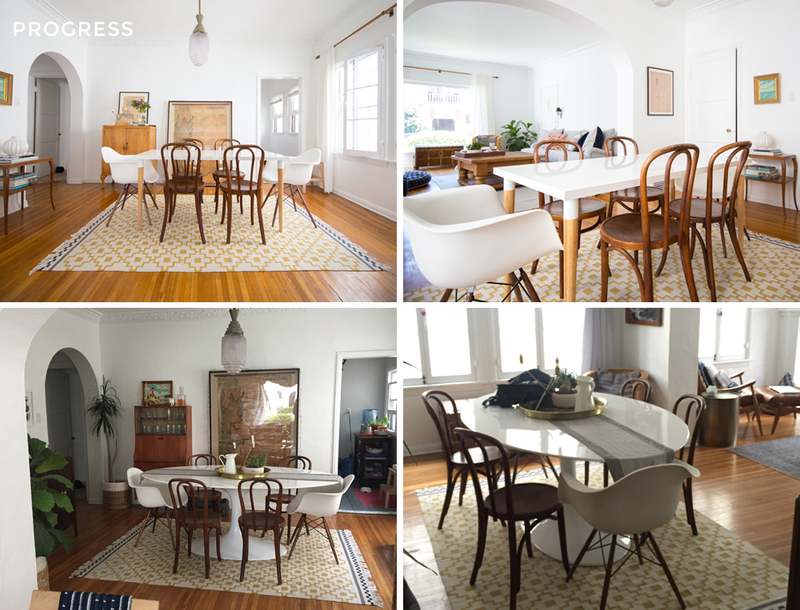 I bought the bentwood chairs from the flea market just after we moved in – I literally carried all 4 at the same time in the steaming Pasadena heat, through reams of hoarding shoppers – (I was working out a lot more then). Needless to say the AC was blasting in the car on the ride home. Ugh looking back at these progress photos is cringeworthy. I think most people expect designers to have these amazingly put together homes but it’s not always the case because sh*t costs money and sh*t takes time and we’re FOREVER changing our minds – or at least I am. 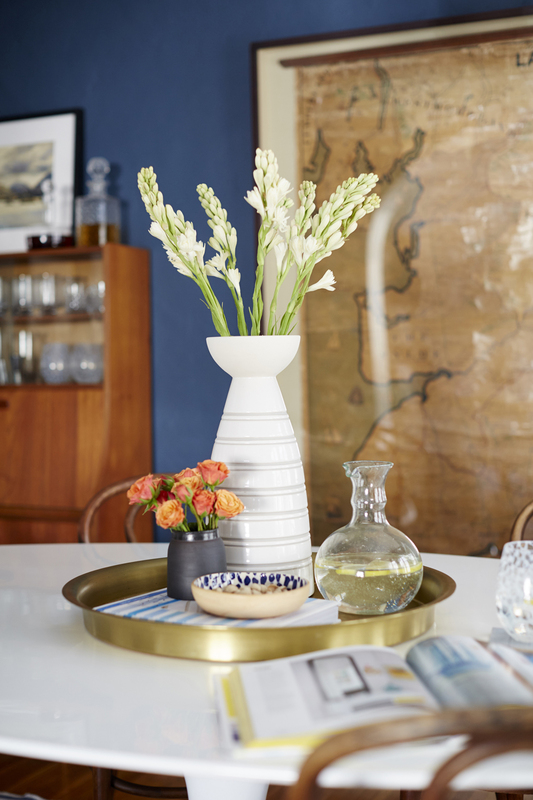 I always like to have a tray set up on my dining table and I love this brass one from Schoolhouse Electric, it really pops off the white. I mixed a few different pieces of pottery here. 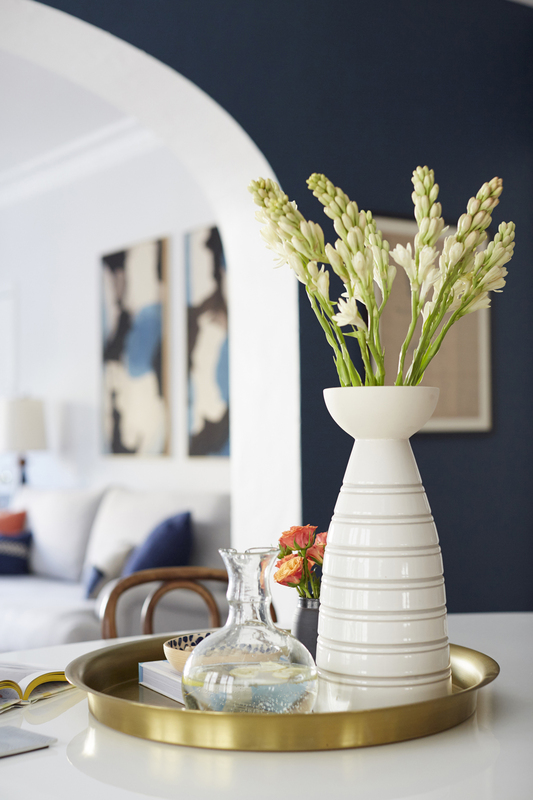 The small black vase is from Melanie’s (one of our awesome designers) BF Blake Beaudette who is a legit amazing ceramicist. He started pottery about a year ago and is now finding his niche and what his style is and we’re loving it at EHD. I think what I love best is that it does feel kind of old world in here and wouldn’t feel too out of place in England. I feel like a lot of older building back home have mismatched furniture that has been handed down through generations. And whilst none of these pieces have come from any of our family members, they did belong to someone one day. 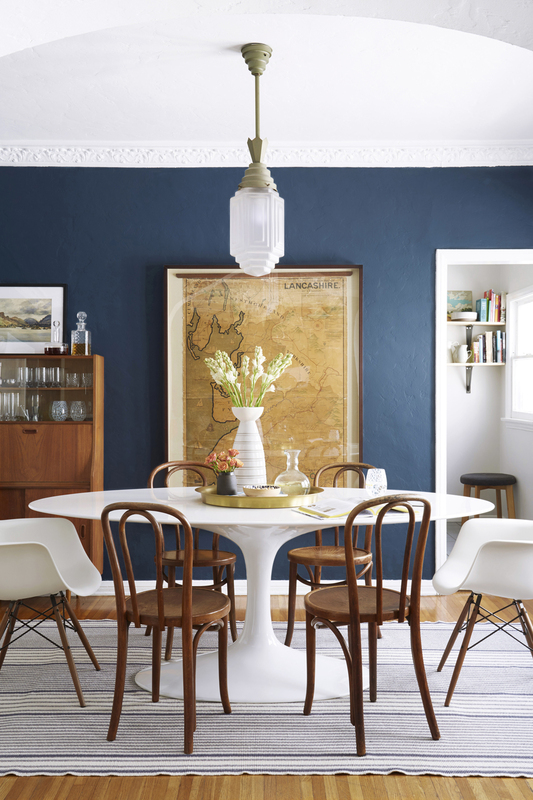 So there you go, my moody transitional dining room. What do you think? Do you love the blue as much as me? Both rooms are absolutely beautiful. I’m a UK reader of Emily’s blog (I live between Bath and Bristol but I know Lancashire and Yorkshire well!) 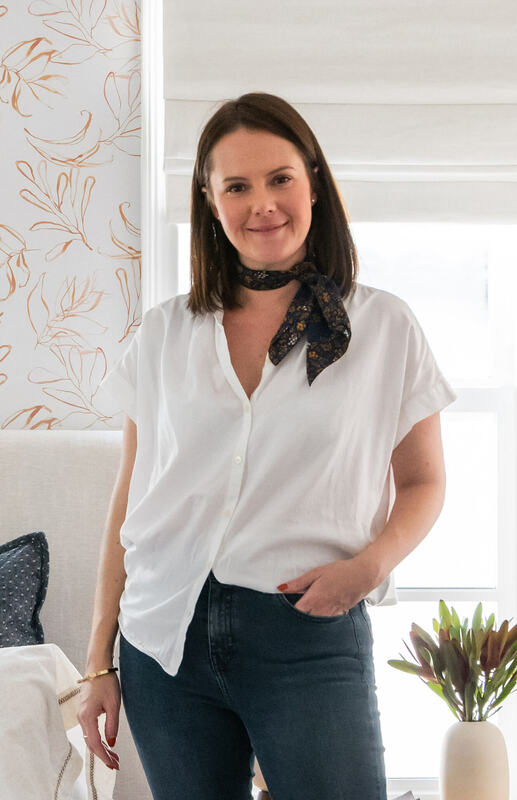 and my dream style is basically EHD with a British twist – and this is it! Literally the rooms of my dreams. Can’t wait to see more of your work! First, I love your style. You and Emily are such inspirations to me. 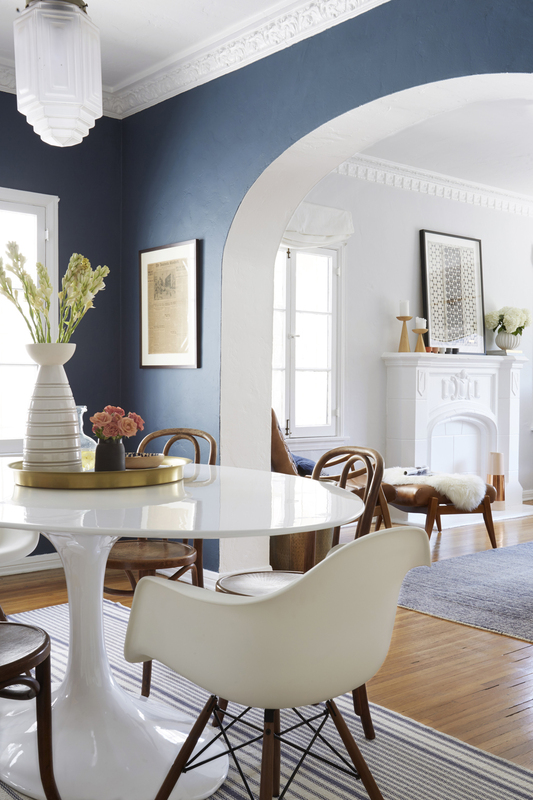 I love how you mix old and new, antique and modern — your aesthetic feels approachable and inviting. 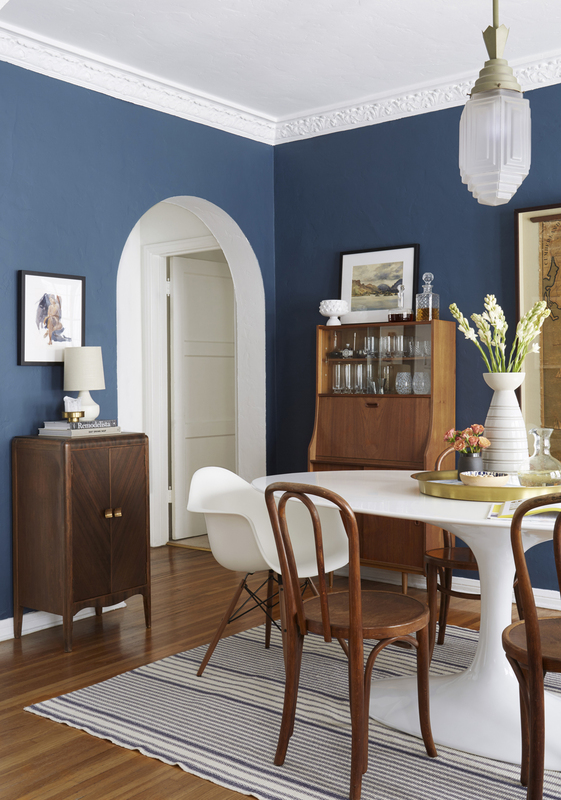 I am in love with the paint you’ve chosen for your dining room and I’d like to use the same color in my home but I can’t get past Farrow and Ball’s price tag. 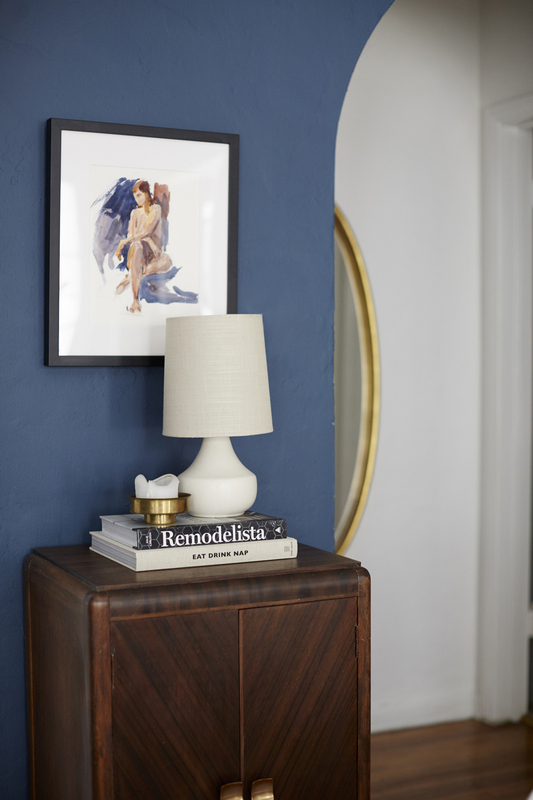 Do you have experience with this paint brand vs. Benjamin Moore, for example?